The website that brought renters, homebuyers, and realtors a powerful index of walkability has done it again, this time for public transit (source: walkscore.com). 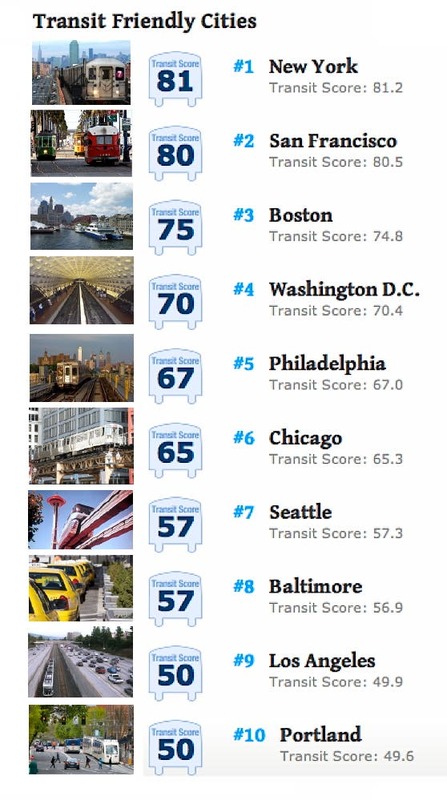 At the end of January, Matt Lerner, CTO of Walk Score, announced a new ranking of the average resident’s access to public transit in a city. It’s based on data released in a standard format by public transit agencies. Lerner cites growing evidence that buying a house or renting an apartment near public transit is a smart idea. • First, it’s likely a better investment. The National Association of Realtors found that home values performed 42% better when they were located near public transit. In Boston, a recent study showed that home prices near public transit outperformed the region by 129%. • Living near public transit saves you money. The average American spends $9,859 per year on their car. Did you know this is the equivalent of a $135,000 mortgage?! Transportation is the second largest expense for American households. • And living near good public transit might just make you happier—after all, nobody likes being stuck in traffic. The company looked at over 1.9 million locations in 316 cities (almost 7,000 neighborhoods) for places to live with better commutes and more transportation choices. 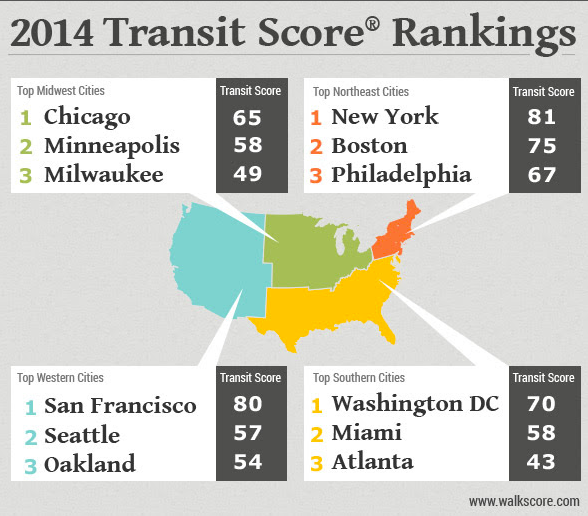 Scorers used a population-weighted methodology to compute each city’s average Transit Score. 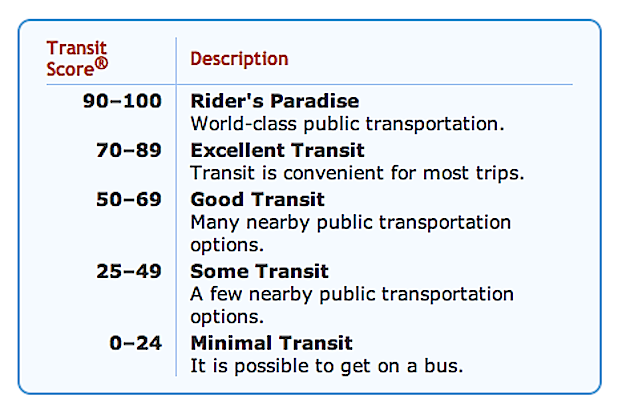 Above, the scoring scale for transit access. A corollary analysis split the nation into four regions and calculated the top 3 cities in each (see photo above). Walk Score offers an iPhone app and an Android app to help you find the best public commutes. As well as public transit access and walkability rankings, the company has previously generated a detailed scorecard on metro bikeability. All told, Walk Score has contributed another pioneering and valuable new tool here for home seekers and realtors. Look for an update soon on some questions and tweaks about Walk Score’s methodology and presentation.